Virtual Reality (VR) and Augmented Reality (AR) have experienced various degrees of popularity and success since their earliest manifestations in the mid-20th century. In the post-Pokemon Go era, however, it is time to seriously rethink their role in popular culture, entertainment, and digital marketing. In an age of short attention spans and free ad-block software, many digital marketers are struggling to reach an online audience. Ad blocking increased 30% between 2015 and 2016, and as of December of 2016 615 million devices used some kind of adblocker. And these trends are costly for digital marketers; a 2017 report shows that internet advertising costs have increased 12% in the last 3 years–five times more than inflation. Clearly, digital marketers are spending more money to reach fewer and fewer customers, and some companies are turning to virtual and augmented reality to boost customer engagement. What’s the difference between VR and AR? Although the terms are sometimes used interchangeably, there are important differences between virtual and augmented reality, and their relative impact on digital marketing. Both alter users’ perceptions, but VR is much more immersive, transposing users into a completely new environment through the use of headsets and consoles like Google Cardboard and Oculus Rift. 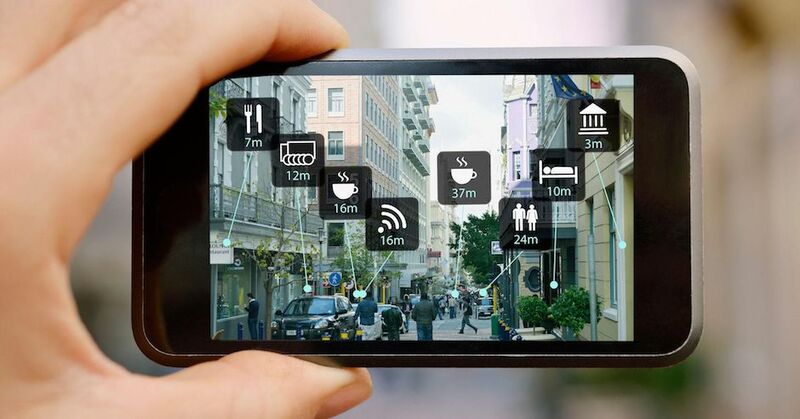 Augmented reality, by contrast, takes users’ current environment and adds something to it. Apple CEO Tim Cook described this distinction, saying: “I’m excited about Augmented Reality because unlike Virtual Reality which closes the world out, AR allows individuals to be present in the world but hopefully allows an improvement on what’s happening presently…That has resonance.” While less immersive than VR, AR allows users more freedom, and gives marketers more possibilities since they don’t need to work around a head-mounted display. Most marketers are prioritizing augmented reality over virtual reality, primarily because of the expensive and inconvenient nature of VR headsets and other required equipment. AR is the more natural way to engage consumers: everything they need to experience augmented reality is right on their mobile device. In fact, AR revenue is set to outstrip VR revenue by $120 billion in 2020, as more and more tech developers forgo headsets in favor of creative AR engagement solutions like the ones show in this video. How can VR/AR be used in digital marketing? No longer must the phrase “virtual reality” be inexorably tied to giant metal headsets or dorky glasses; VR and AR have diversified to take a variety of different forms in the modern digital world. New technologies are being explored that can simulate medical symptoms, allow virtual-reality social interaction, or–in the case of IKEA’s Place app–allow customers to preview furniture in their homes before purchasing. Lighter, more convenient headsets like Google Cardboard have become popular, as well as AR innovations like 360 degree photos and videos, which require nothing but a computer or smartphone. Although unique innovations like the Place app and medication company Excedrin’s migraine simulator are still relatively uncommon, a huge impact in the digital marketplace has already been made with 360 degree photo and video. As we mentioned in an earlier blog post, video marketing will be hugely important in 2018, and many companies are capitalizing on that with 360 degree video. 360 Facebook ads are in development as well, which would allow customers to shop virtually and showcase products in real-life settings. Snapchat is entering the 360 degree ad game as well, with branded 3D objects as interactive filters. An increasing number of major companies are rolling out augmented reality campaigns, including CocaCola, Nivea, Starbucks, and Volkswagen, and wearable AR tech is being developed by Microsoft, Apple, and Google. Other companies like Sprint, McDonald’s, and Starbucks are partnering with existing AR products like Pokemon Go for advertising. 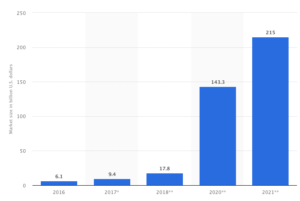 And digital marketers are putting money where their mouths are; global AR advertising spending increased almost 100% between 2015 and 2016, and is projected to reach $215 billion by 2021. Of course, the real impact of VR/AR tech remains to be seen, as technology is still developing and is yet untested in a majority of industries. But in an age where digital marketers are struggling to keep their customers engaged, the right augmented reality tech might be just the solution you need.